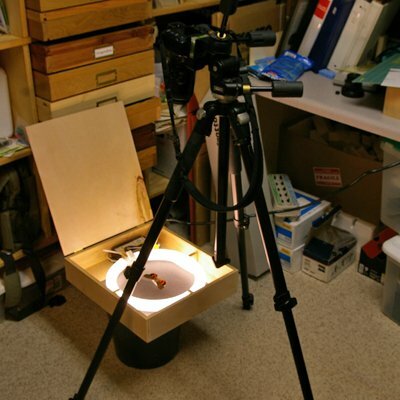 The method I use for photographing moths on the sheet includes using a 100mm macro lens with a ring flash. With the lens I also add a 1.4x extender. I set the camera on Av mode. I use an F-stop of 11. The camera sets the shutter speed to sync with the flash. On my camera that is 1/160 sec. I also use auto focus. The reasoning behind the setup is that I am trying to get the best depth of field I can. Depth of field is the space on either side of the subject that is in focus. The greater the depth of field, the more of the subject that is in focus. When you are shooting macro pictures at a few inches, the depth of field is about 1/32 inch, maybe. With the newer, higher pixel sensors on the digital cameras, I recommend that people not get so close to the subject. All other things being fixed (shutter speed and F-stop), the distance to the subject comes into play. The depth of field decreases as you get closer to the subject. I recommend that the subject only fill about half of the frame. Most people will crop their photos and pick a size based on what they plan to do with the photo. By not getting too close, you are helping with the depth of field. Also try to keep the subject parallel to the camera sensor. This can be hard when you are laying down on the ground and the moth is about a 1/8 inch size. Also a suggestion I received from a fellow photographer, was to focus on the sheet next to the really tiny moths. This tends to keep a constant focus. With auto focus, the camera will try to keep up with movements of the sheet. For photographing pinned specimens, I have gone through the following methods but currently use the copy stand to hold the camera. 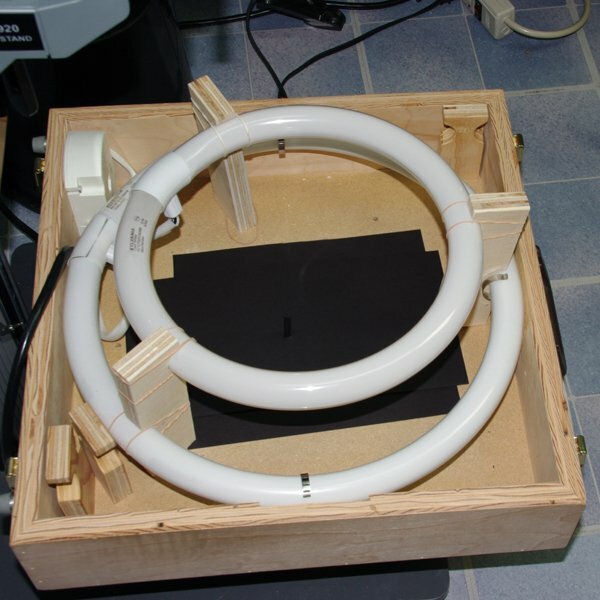 The picture to the left shows a light box that I made from a florescent light fixture. 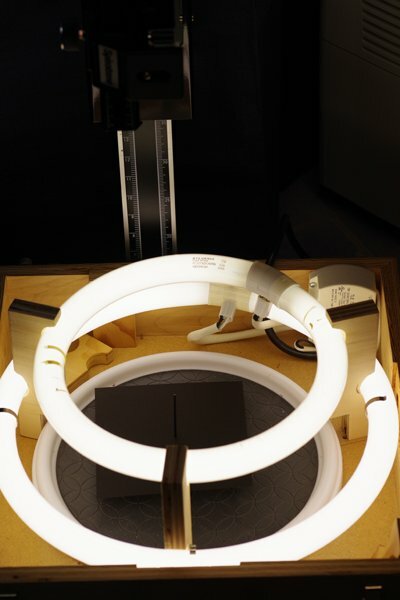 I remove the smaller bulb while photographing large specimens to prevent a halo from showing in the picture. I also made a hole in the center of the bottom of the box where I place a piece of pinning foam. 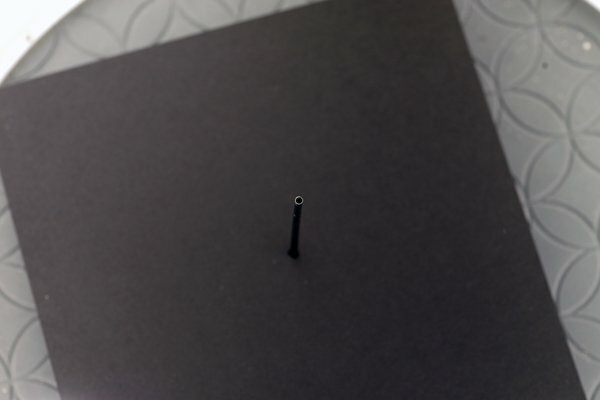 Over that I place a piece of black paper that I got from Michael's. You need a piece of black paper that has no pattern. I punch a small hole for the pin in the specimen. The black paper helps with shadows and I think gives a great contrast to the specimens. You need to have a soft bristle brush to brush away the dust. Make sure to brush often or you will have white dust spots in the picture background. For the light fixture, buy the newer white light bulbs. You will still need to color correct to get rid of the yellowish cast that florescent bulbs produce but the newer bulbs are not as bad. 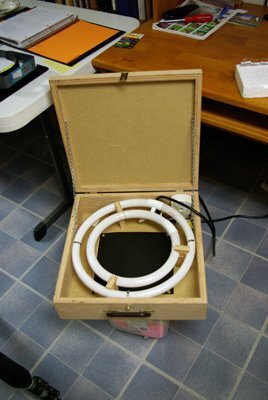 Picture 2 shows a setup on a table. You use incandescent bulbs and shine light through white material to make the lighting even. 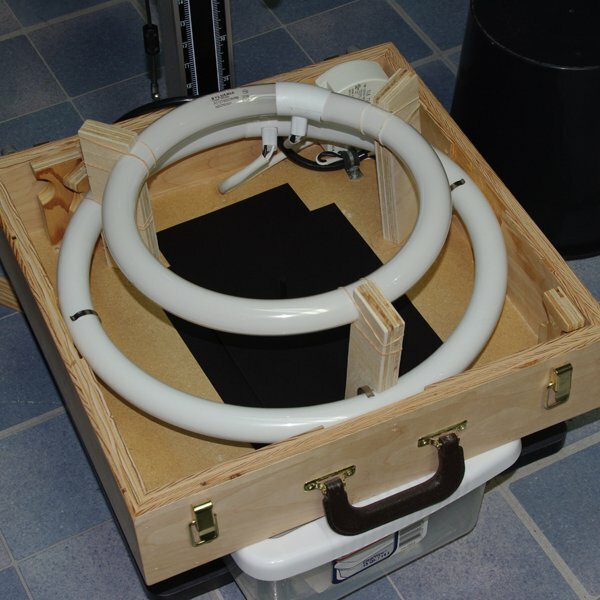 Picture 3 shows a setup using a tripod to hold the camera over the light box. 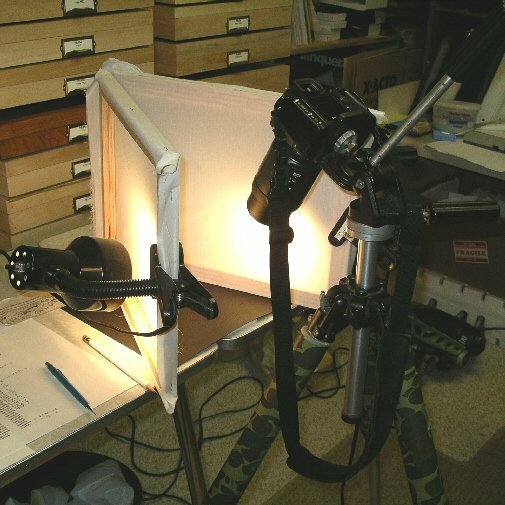 Picture 4 shows a setup using a copy stand holding the camera. This method is superior because it holds the camera more rigid and allows it to move up and down vertically. The above pictures show the latest modification to my setup. Based upon a suggestion from Jim Vargo (Moth Photographer Group), I raised the smaller bulb three inches which gives more even light while also being brighter on the specimen. 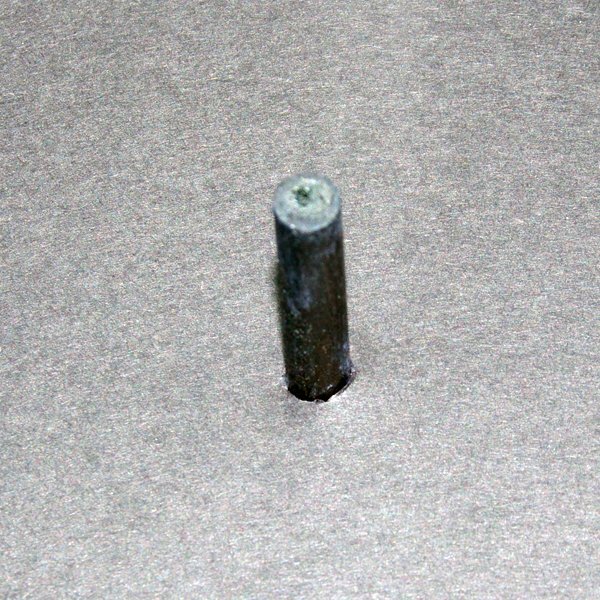 I also took a quarter inch wooden dowel, cut to two inches, drilled out the center, added black modeling clay, and attached the dowel to a small wooden piece. 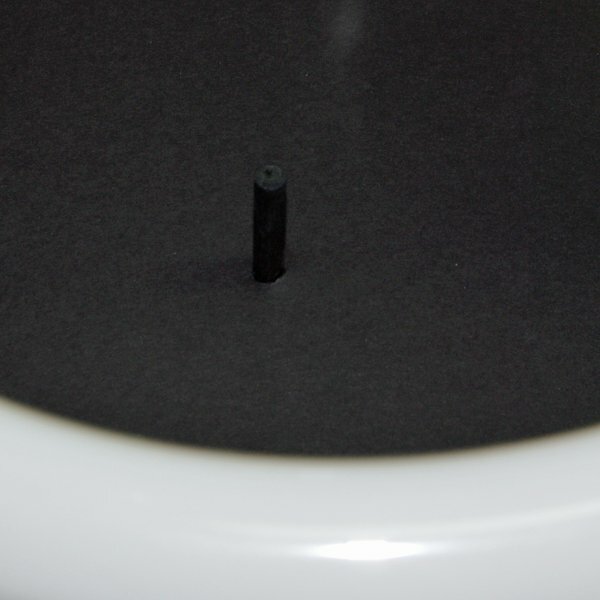 I colored the dowel black with a magic marker. 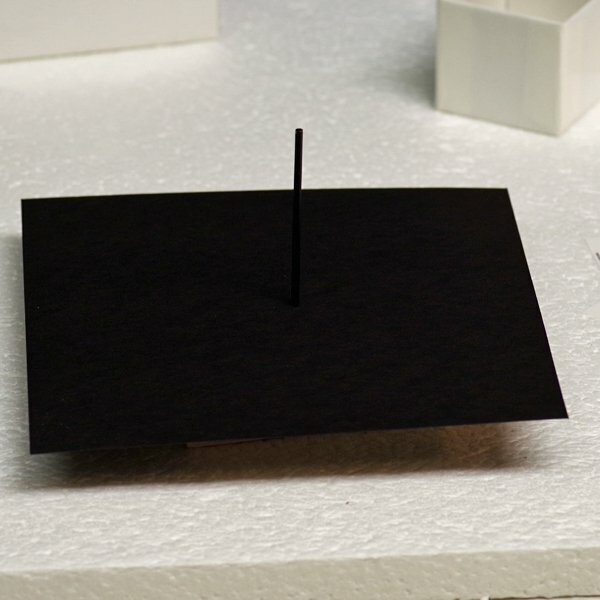 The dowel is then inserted through the black background paper. This raises the specimen about three inches from the paper. This causes the background of the photo to be more out of focus and not distracting. This also solves the problem I had with bigger specimens where I had to remove the smaller bulb to get rid of the halo. I have the original spacers for the bulbs which allows me to lower the small bulb and put the lid on the box for traveling. I made a mod to the above method after finding some ink refills for a small ink pen. The refills are about 3 inches long. I mounted the refills into a wooden block about 3 inch square. I painted the refills black. I put a piece of black paper around the refill. The refill is smaller than the wooden dowel I had used. It turns out the inside of the refill is large enough for the round part of the insect pins to fit. This allows me to turn the specimen over and photograph the underside. The underside can be helpful for identification in some insects. I also found a lazy susan and have it in the bottom of the setup. This allows me to position the insect without touching the insect. I do this to square up the specimen when photographing. I use a 100 mm macro lens and add a 1.4x adapter for the really little micros. For exposure, I shoot at F8 and 1/20 sec. When I get to specimens that are about 2 inches or bigger, then I have to go to my 35 - 105 mm lens. Another thing that I do is photograph the specimen with the wings spread vertical. This insures that when I take the picture, I can crop the image 6 x 6 at 100 dpi to put on the website. Some people zoom in close and then you can only crop with a rectangle. When I photograph mounted specimens, I use mirror lockup mode on the camera. 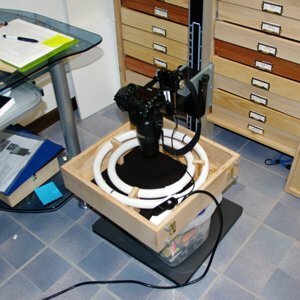 When photographing tiny specimens, this allows the vibration setup by the mirror flipping out of the way to soften, and then the camera takes the photo. I was having a problem that photos of the micros were out of focus and finally remembered that the mirror creates vibration when it moves out of the way. Using the mirror up mode eliminated the problem.